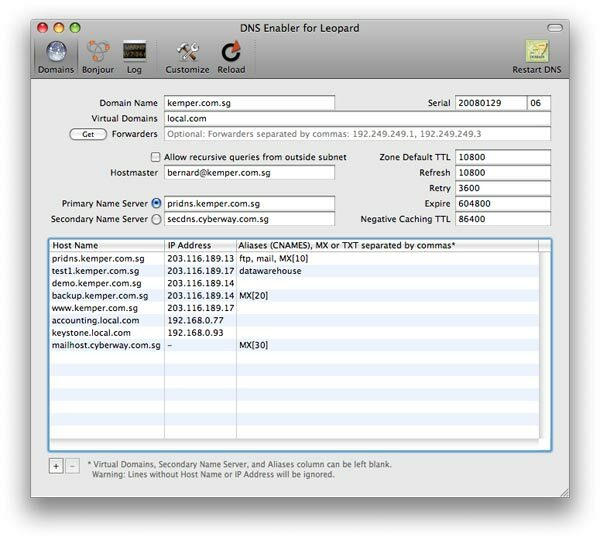 DNS Enabler allows Mac users to set up a fully-functional Domain Name Server on a plain Mac OS X machine with just one click. It is designed to allow a user to set up domain name information quickly using a single window, in the least amount of time. DNS Enabler provides the interface to allow users to specify name-to-address mappings, as well as their aliases. Additionally, it allows users to set the domain and zone information, like the Domain Name, Host Master's email address, and the Time-To-Live intervals that determine the validity periods for the domain information. It will generate the appropriate named.conf file, the forward mapping files for each domain, the reverse mapping files for each network, and all the resource and reverse pointer records for the user automatically from the specifications entered. 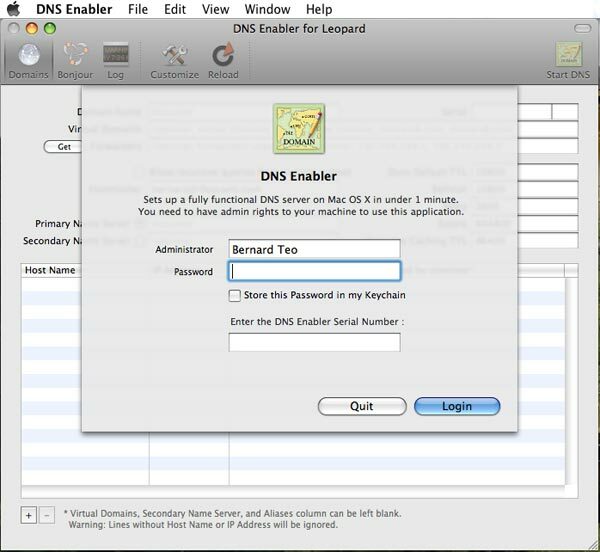 You can configure DNS Enabler using a non-admin account. Just provide either the full name or the OS X short name of an admin-level user and the administrator's password. DNS Enabler now sports a customizable toolbar, containing three panels - the main DNS Enabler domain configuration panel (shown below), a panel to set up Bonjour Wide-Area Services, and a Log Panel showing the contents of the named.log. You can start, stop, and restart DNS services. And there is a button to reload the data with the settings currently in effect at the server. Scenario : DNS Enabler on a private local network. You've set up a local network behind a router or a base station for testing or for doing web development. Important Note : On the machine that you're running DNS Enabler, in its Network Preferences, its DNS Server setting should always point to itself. You can now point all the other machines on the local network to use 10.0.1.201 as their name server (via the DNS Server setting in Network Preferences). This way then, all the local machines can now access the web, mail, ftp, and other servers via their domain names. If you've also set up aliases, you can also hit the web server by typing www.lifeassets.com into the browser. 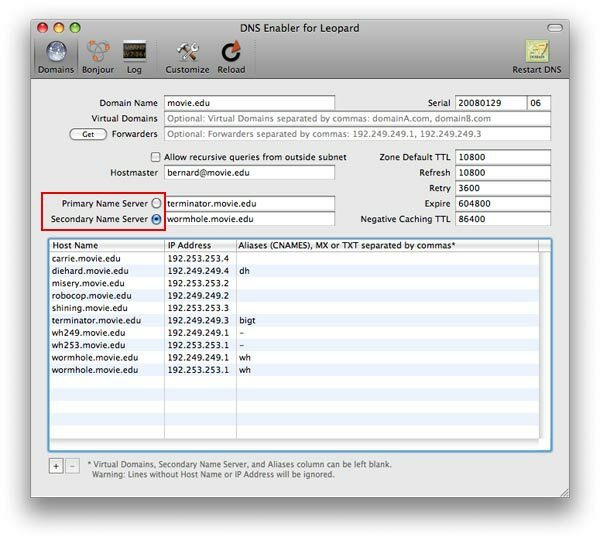 In this case, you can use DNS Enabler to broadcast the domain name to all the local machines (using the simple configuration outlined above) and help them find their way to your server. This has helped many MailServe users who are behind routers that don't know how to route outgoing packets back to an equivalent local IP address (that the public IP address is port-mapped to) and that are also hard to configure, to boot. Another benefit of running a DNS Server on the same machine as your web and mail server, in the way described above, is that your web and mail server will both "know" what their domain name is when they each start up (which they won't if you're running off a dynamic public IP address but sitting behind a router on a private network). This is crucial, for example, in making SSL work because, for SSL to work, three things must line up - the name the server knows itself by, the name on the SSL cert, and the name that people use to access the server. Scenario : DNS Enabler on a public network. Introducing MX records. The machine that runs the name server is also the mail server and ftp server. Therefore, we give it the appropriate aliases, mail and ftp. We also add the label MX to indicate that pridns.kemper.com.sg, alias mail.kemper.com.sg, is providing the mail service for the domain kemper.com.sg. Note : If we have a host with the same name as the domain, and we run the mail server on this host, we won't need to use an MX record. 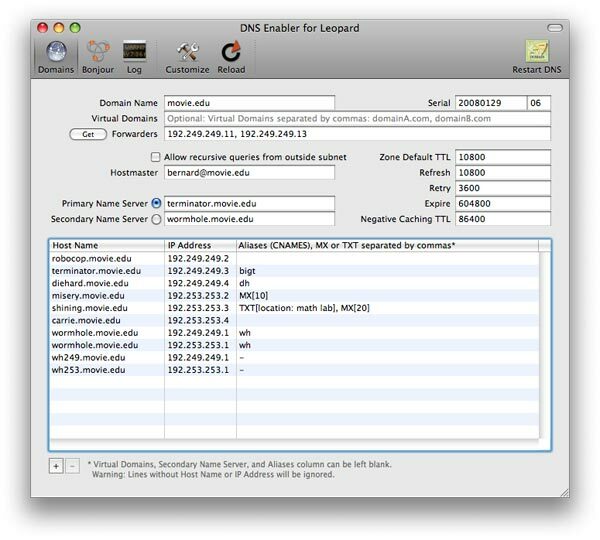 In the example above, DNS Enabler should be installed on the machine named terminator.movie.edu, which is the primary name server for the domain movie.edu. When you hit the Start DNS button, DNS Enabler will read in the name-address mappings, start up name services so that other computers can get answers to these name-address queries, and keep these running across reboots. Forwarders are useful if you need to shunt name resolution to a particular name server. e.g., to keep off-site search for domain name resolution to a minimum to improve network traffic. In the example above, 192.249.249.11 and 192.249.249.13 are the site's forwarders, and you list them in the Forwarders field, separated by commas. DNS Enabler can auto-populate the Forwarders field based on the DNS Servers list that the user has set up in his Network Preferences. Just click the Get forwarders button. When you hit the Start/Restart DNS button, wormhole.movie.edu will now run in slave mode. Make a change to the primary server (terminator.movie.edu in our example) and you will see the change propagate to the slave when you hit its Reload (Current Data) button. The Start/Restart DNS button is then disabled in the slave to prevent you hitting it again. Use the Reload button in the slave to always see the latest state of the master. You can activate the Start/Restart DNS button again, if you decide to set this server up as a master some other time, by clicking on radio button next to the "Primary Name Server" label. DNS Enabler can also set up multiple secondary slave name servers. Just create a list of the slave servers' host names, in the Secondary Name Server field, and separate them by commas. 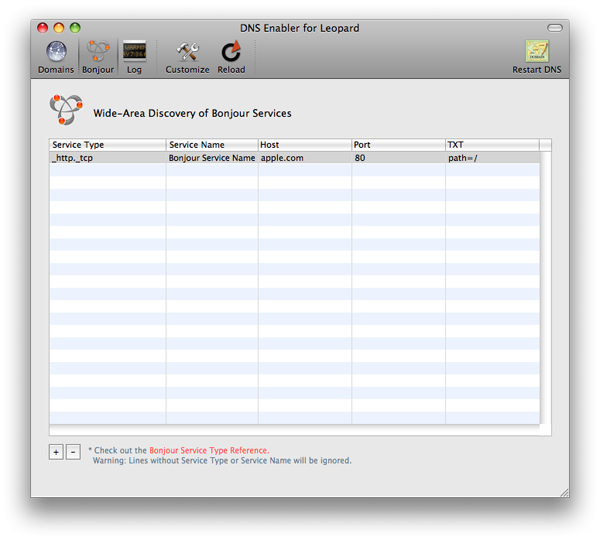 More information about the types of Bonjour services you can currently configure, and what you need to enter into the individual columns in the Bonjour panel, can be found at : http://www.dns-sd.org/ServiceTypes.html e.g., DNS SRV (RFC 2782) Service Types. What DNS Enabler saves the user is the need to know the specific syntax to set up SRV and TXT records at the DNS server. All he needs to know is the Bonjour service type, e.g., _http._tcp for publicising web pages (that may be served even from local private networks - you can use the Port number field to publicise a different port other than 80 and port-map that incoming request to a specific local machine) and the domain that will serve that request. The service name is a label that will show up in the Bonjour menu in, say, Safari. And the TXT column contains the path to that specific web page. (The TXT column stores different things for different services. See the cited Bonjour reference). The Customization Panel allows you to re-arrange the DNS Enabler toolbar. For example, if you don't use Bonjour, you can hide the Bonjour button and, consequently, the Bonjour panel. 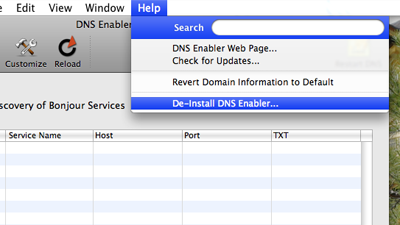 You can de-install DNS Enabler by using the menu item, shown below, in the Help menu. It will shut down the DNS Server, if it is running, and remove all files installed by DNS Enabler. DNS Enabler for Leopard works from its own folder in /usr/local/cutedge/named, in which are stuffed the named.conf and the db files used by DNS Enabler. The original /etc/named.conf and /var/named files are left un-touched by DNS Enabler and so DNS Enabler leaves your system in its original state after de-installation. The Help menu also contains links to the DNS Enabler for Leopard web page and it can be used to check that web site for new versions. If you're planning to upgrade to Snow Leopard and use the corresponding new versions of all our apps, this is what you need to do. First save your config using the File menu. Then de-install the app from the Help menu. Upgrade to Snow Leopard. Then run the new Snow Leopard version of the app with the saved configuration. DNS Enabler for Tiger serial numbers don't work on Leopard. 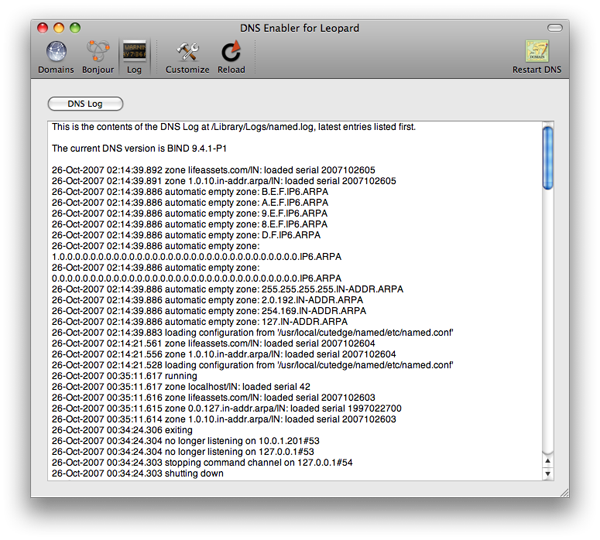 Please support our work by purchasing a serial number for DNS Enabler for Leopard. But, if you're already a PayPal user and elect to pay by credit card, you'll need to use an alternate email address that isn't linked to your PayPal account. Version 3.0.1 fixes a bug with the DNS Log button in the Log Panel, which had caused DNS Enabler to hang when the size of the log file got too big. Version 3.0.2 - systems that were upgraded to Leopard, instead of being clean-installed, may have some DNS-related launchdaemons left over from the Tiger install. 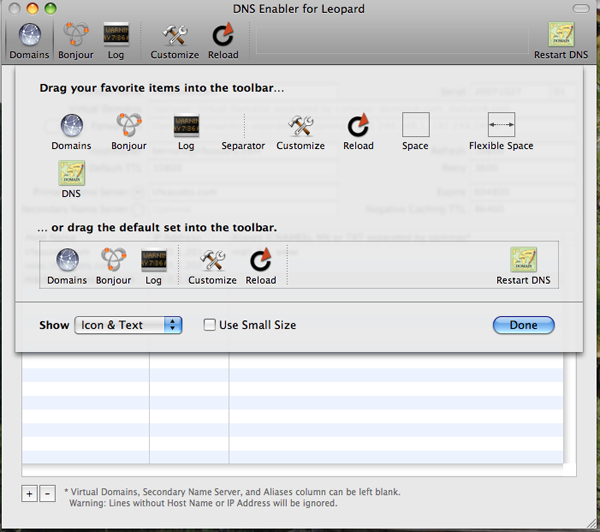 DNS Enabler for Leopard now disables them if it finds them active while starting up. Version 3.0.3 - Leopard uses BIND version 9.4.1-P1, whch is set up by default to disallow recursive queries from outside the subnet that the server is on. DNS Enabler now allows the user to change this behaviour. Version 3.0.4 - fixed the config file to work with Apple's latest BIND 9.4.2-P1 update. Eliminates the "using specific query-source port suppresses port randomization and can be insecure" warning.